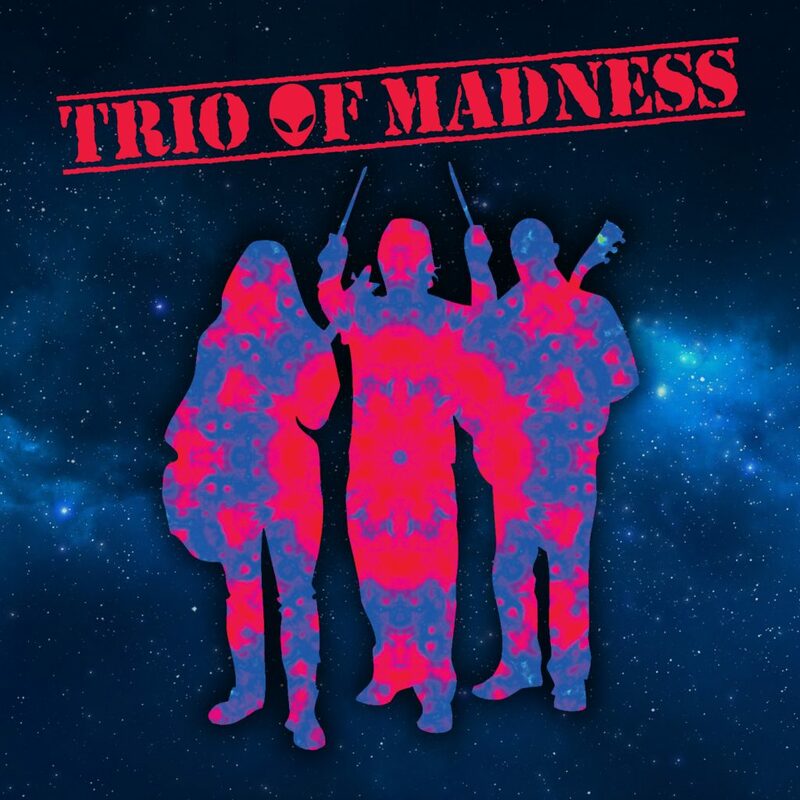 From the farthest reaches of space and time, beyond casual music appreciation, a galactic sound known as Trio of Madness has emerged. Actually, Trio of Madness has been infiltrating the global music scene for years, enlightening as well as sometimes confusing the minds of music lovers with their strange blend of psychedelic/surf/progressive/space rock. Trios members bring their own individual style and sound, each having been influenced by a wide variety of disciplines including music (hard rock, classical and world music) surrealism, humor and a touch of the paranormal.Known for their unique grooving time signatures and visual stage effects, the band has made it their mission to give you a mind-blowing, toe-tapping experience, while at the same time putting a smile on your face.Trio of Madness came into existence one fateful day at a NJ rehearsal studio, when longtime friends, Nick Charles (guitar), Liz Gonzalez (bass/vocals/violin) and Mike Wojik (drums/random noises/vocals) decided to jam on some acoustic instrumental ideas. Trios Liz recounts, Mike also invited a musician friend down to try out on vocals. Halfway through practice, the vocalist excused himself to use the bathroom, and was never seen again. It was at that moment we realized our fate..this band was meant to be primarily instrumental. Over the years, the bands sound has grown, transforming into a heavier, more complex, electrified version of themselves. Their upco ming release Lost Time, a nod to either the UFO enigma or the time between Trio albums, also features vocals on a number of tracks, including guest vocals from fellow label mates A Halo Called Freds own Geverend. Recorded and mixed by Anthony Kroposky (A Halo Called Fred/Little Dipper) at Fish On Fire Studios, East Stroudsburg, PA and mastered by Carmen Venderosa of Woodrock Studi os, Raritan, NJ. Lost Times 14 tracks celebrates Trio of Madness musical creativity, and above all, the fun and joy the band feels when writing and performing their own unique blend of original music. Lost Time will be performed in its entirety at the albums release parties on Saturday, March 18 at Roxy & Dukes Roadhouse 745 Bound Brook Rd, Dunellen, NJ and Sunday, March 19 at John & Peters, 96 S. Main St, New Hope, PA. Lost Time will be available for download at LumpNLoaf Records and online retailers on Tuesday, March 21. 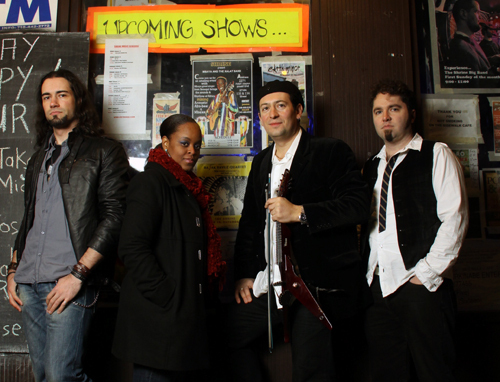 Stratospheerius features Joe Deninzon on electric violin and lead vocals, drummer Jason Gianni (Neal Morse Band, Trans Siberian Orchestra, Mark Wood), bassist Gary Pickard (Cassandra Wilson, Steve Coleman), and guitarist Michaelangelo Quirinale (Thrilldriver). Due out this fall is GUILTY OF INNOCENCE Joes 8th album & Stratospheerius 5th. The band’s electric violin-driven progressive hard rock incorporates elements of metal, funk, jazz, and Middle Eastern music. Stratospheerius has played at colleges, festivals, and clubs throughout the US, opening for Martin Barre, Tim Reynolds, Mike Stern Mickey Hart, and John Scofield. The group was a winner in the John Lennon Songwriting Competition and the Musician’s Atlas Independent Music Awards. Joe Deninzon has been hailed by critics as The Jimi Hendrix of the Violin, because of his innovative style on acoustic and electric seven-string violin. In an article Seven Reasons to to See Joe Deninzon, writer Peter Chakarian states that Joes both improvisational in performance and in where his career has taken him. A musician who transcends many genres, Joe has worked with Bruce Springsteen, Sheryl Crow, Les Paul, Phoebe Snow, Aretha Franklin, and Ritchie Blackmore, and performed for President Clinton. He can be heard on over 100 recordings and jingles as a violinist and string arranger. Mel Bay books has published his book/CD/DVD “PLUGGING IN: A Guide To Gear and New Techniques for the 21st Century Violinist.” In 2015 Joe debuted Dream Diary: Concerto for Seven-String Electric Violin and Orchestra with the Muncie Symphony Orchestra, and world renown violinist Rachel Barton Pine debuted Joes composition The Electric Lake of Soul at Interlochen Music Festival. Joe is a 14-time BMI Jazz Composers grant recipient and winner of the John Lennon Songwriting Contest. He has taught rock violin at Mark OConnors String Camp and teaches at Mark Woods Rock Orchestra Camp, and has made repeated appearances performing with harmonica legend Robert Bonfiglio at the Grand Canyon Music Festival, where Joe co-founded the Grand Canyon School of Rock in 2006, an annual program for local high school students. He also has been involved in the Native American Composers Apprenticeship Project (NACAP), which won the President’s award from the National Endowment for the Arts. He continues to travel throughout the world as an on-demand clinician and performer.